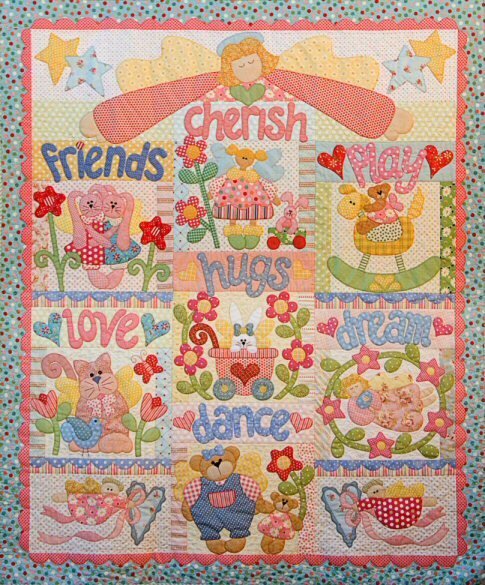 Playing with Angels is a gorgeous quilt for children of all ages. A colour photo is included for each block. Suitable for beginners to advanced quilters. Any method of appliqué can be used. (Cutting instructions allow for turn-under appliqué). Pattern available separately for A$89.10 or $9.90 per month - each plus postage. Note - Some of the fabrics used by Kookaburra Cottage Quilts in the original quilt are no longer available and we have substituted as close as possible to the original.